In Onam Sadya one of my favourite dish served is Kaalan. Kaalan can be prepared with various veggies. Generally it is being prepred using Raw Nenran banana/ Ethakka and Yam/ Chena. I love the mild spiciness from the pepper and green chilli and the sour taste of yogurt. 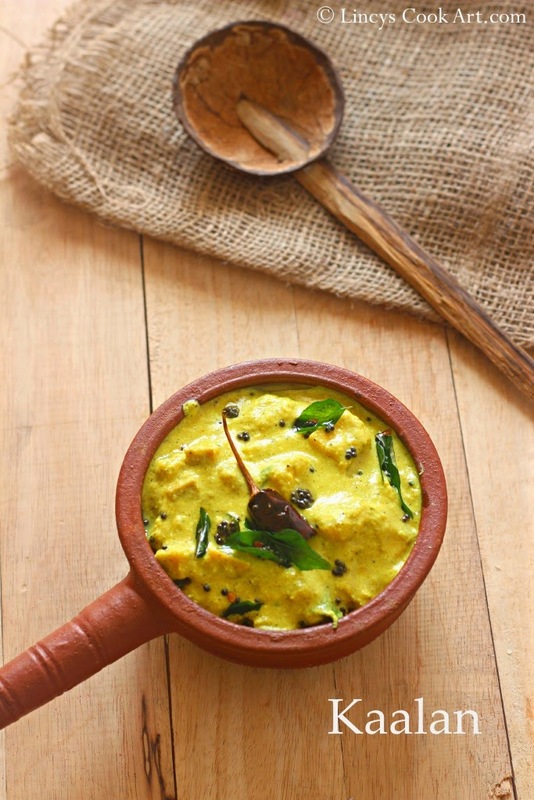 This Kaalan is prepared in two ways slightly liquid in some places and thick in some places called 'Kurukku Kaalan'. This Kaalan can be prepared and stored in refrigerator for a week. Donot reheat on stove when it is chill; it may split the curry. Bring it to room temperature and serve. Cut the Nendran banana and yam in to medium sized pieces. Add two cups of water, turmeric powder and pepper powder with this and cover with a lid and cook for five minutes. When the pieces half cooked add the salt. If you add salt at the beginning these both veggies take time to cook. Again close with a lid and cook a minute more. Now add the beaten curd and mix well and cook further till the veggies cooks well. Grind coconut, green chillies and jeera together as a fine paste. Add this ground paste and curry leaves and mix well. Cook for another one minute when the kaalan starts to thicken sprinkle some fenugreek powder on top and switch off the gas. Heat oil in a pan and splutter the mustard seeds then add the dried red chilli and curry leaves. Add this tempering over the curry and mix well. Note: For more taste use slightly sour curd. If your curd is not sour keep the curd at room temperature for half a day. Some store bought yogurt starts to split once you add into the curry when heat is on. So speed is essential in this case. In this case cook thoroughly the veggies before adding the curd. Reduce the flame and add the yogurt and coconut mixture and just allow to heat and switch off the gas. Slightly roast some fenugreek seeds and finely powder them and use it for the recipe. Love this subzi, Nice presentation !! One of my fav dish in sadya, looks delicious. Shall do it for this on am. But when should we add pepper to it?? Add pepper and turmeric when u cook the veggies initially. Check the second line of the recipe. Unlike other dishes we have to add pepper initially in this dish. Delicious, mouthwatering Kaalan, love with rice.